It's almost time to find out if you're getting all the gifts on your list this holiday season, or if you'll wake up Christmas morning to a stocking chock-full of coal. If you cheated, lied or snuck three fun-size candy bars when no one was looking, you may just find yourself on the naughty list. But American Atheists wants you to know that if you skipped church this year, it won't tell Santa. 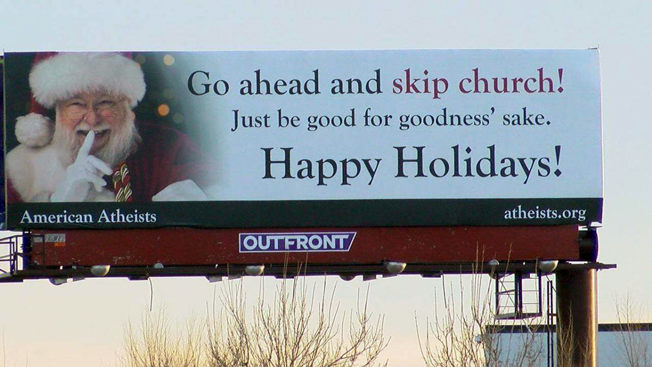 The organization has already raised a few eyebrows with its latest holiday-themed billboard. Running in Colorado Spring, Colo., and Winston-Salem, N.C., the billboard reads, "Go ahead and skip church! Just be good for goodness sake. Happy Holidays!" "We want people to know that going to church has absolutely nothing to do with being a good person," said David Silverman, president of American Atheists, in a statement. "The things that are most important during the holiday season—spending time with loved ones, charity and being merry—have nothing to do with religion." Nick Fish, national program director for American Atheists, said the billboards were strategically placed in markets where atheist voices aren't always heard. The point is to put them in places where they might stir up a little controversy. "We wanted to challenge the notion that everyone in their town is religious—they're not," Fish told Adweek. "We're trying to make it easier to make people open and honest about what they believe." So far, Fish said feedback from the new campaign has been mixed. Some people have reached out to say it's an attack on Christianity, while others have thanked the organization for spreading its message in predominately religious areas. Fish also noted that he's received two offers from other markets to run the billboards but said no decisions have been made at this time.